Contact Us Related © All Rights Reserved. The Brundtland Report in 1987 defined sustainable development as a “Development that meets the needs of the present without compromising the ability of future generations to meet their own needs” (World Commission on Environment and Development, 1987). 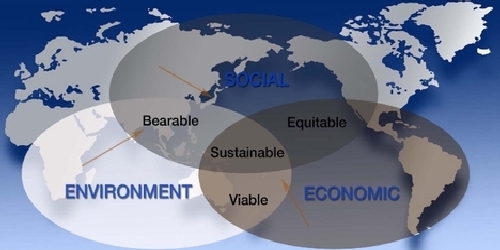 This definition has often been illustrated through diagrams that emphasized the importance of including social, economic, and environmental characteristics (Figure 1). Figure 1: The Sustainability Triade. According to the traditional approach to sustainable development, sustainability depends on our practices in three main areas: the economy, the society, and the environment. In combination, these areas span most aspects of human existence. It is the inter-connectedness of all areas of human life that ultimately determines to what degree our society is sustainable, and it is the inherent complexity that we need to face and address in order to reach sustainability and beyond. For more illustrations of sustainability of our global society on planet Earth, see Computing for Sustainability. Figure from Tiwah, Inc. The definition has been criticized for a lack of a “horizontal component,” which would mandate that at any time now group or country would satisfy their needs by compromising the needs of others living at the same time. Moreover, the definition is a moral or political principle that does not easily lend itself to a straigh-forward operationalization. 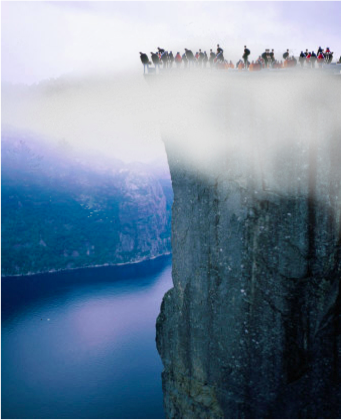 Planet or Humanity: Who is on the Edge? 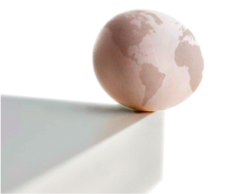 Increasingly, the planet is pictured as being on the edge (Figure 2). Brown (2011) speaks of the world being on the edge, but it is clear from the facts provided that it is not the planet, it is rather humanity and our global civilization that is on the edge (Figure 3). The planet has gone through several extinction class events, which changed the composition of the biosphere fundamentally and initated new epochs. The current Anthropocene may not be a new “epoch of our making” as desribed by Syvitski (2012) and others but rather a planetary accident that is transitioning the planet into a post-anthropocene epoch (Plag, 2013b), in which the planet easily may be outside the “safe operating space for humanity” identified by Rockström et al. (2009), Figure 4. Figure 2: Increasingly, the sustainability crisis is linked to a planet on the edge. Figure 3: Humanity as a global civilization is at the edge of a safe operating space with diffuse boundaries. Modified from Plag (2013a). 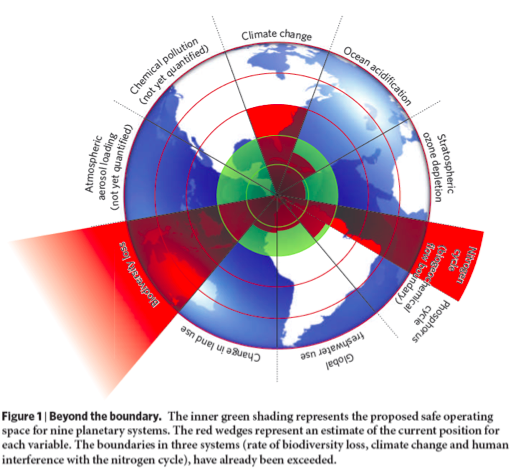 Figure 4: Although not all of the boundaries for a safe operating space for humanity are well known, it appears that we are already crossing some of them, which is endangering the future of our global civilization. From Rockström et al. (2009). There is limited information available on how large business approach sustainability. In fact, an article in The Guardian reports that a recent study found that 97% of the businesses listed on the stock market fail to report even basic facts related to their sustainability. Sustainability ranking of campanies is still at a very early stage, with little assessment of how a company's actions impact the Earth's lifesupport systems. See for example the criteria used by Newsweek here. Griggs et al. (2013) also present a new approach to the three basic areas of sustainability, i.e. environmental, social, and economic sectors of the overall planetary system (Figure 5). They put economy at the center of a society, which is embedded in Earth's life-support system. Thus, they place economy at the center of society and symbolize economy by coins - money. This economy-centered and wealth-growth focused view is perpetuating the long history of a civilization that too often sacrifices the social and environmental quality and functioning for the benefit of economic growth and the growth of wealth of a few. It is also not consistent with the proposed re-definition of sustainable development, which can only be achieved based on a refocused economy. as a “development that meets the needs of the present while safeguarding Earth's life-support system on which the welfare of current and future generations depends. Figure 5: A new triad for sustainable development. Society is embedded within Earth's life-support system but still entertaining an economy centered around increasing wealth. From Griggs et al. (2013). As Griggs et al. (2013) point out, we have entered the Anthropocene, i.e., an “epoch of our making” (Syvitski, 2012). To illustrate the fundamental change this recognition entails, we can use the picture of us having moved from the backseats of the bus to the driver seat. It is now our responsibility to keep the bus on the road of sustainability. This tasks has two basic facets: we need to keep the Earth's life-support system within the “safe operating space of humanity” described by Rockström et al. (2009, and we need to keep the socio-economic processes in a range that can sustain a stable society. We propose that this will not be possible unless we fundamental change the purpose of economy from an increase in wealth to sustaining Earth's life-support system. 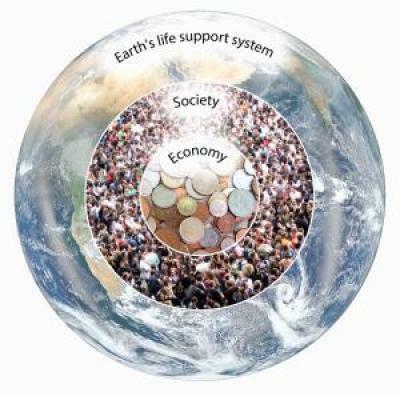 In Figure 6, we have therefore placed economy between Earth's life-support system and society. It is by our economic activities that we interact with Earth's life-support system. We change it, re-engineer it, we utilize it, we provide access to it solely through our economic activities. We also replaced the symbol used by Griggs et al. 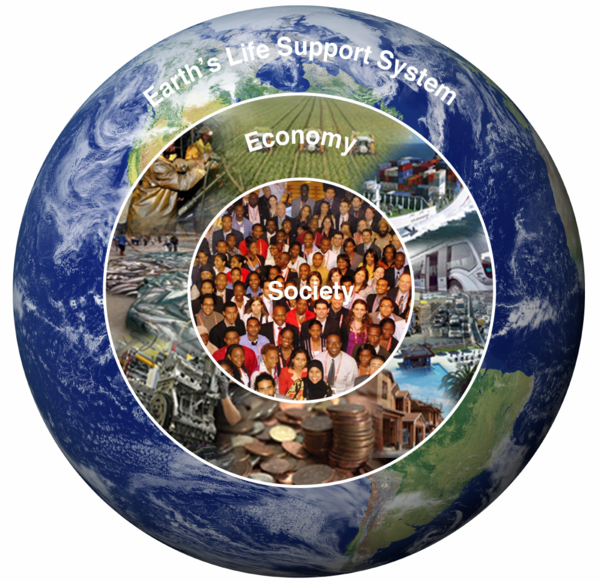 for economy, i.e., money, by the products and services economy provides to us based on Earth's life-support system. Figure 6: Sustainablility through an economy for humanity. The flows between society and the Earth's life-support system are controlled to a large extent by the concepts and rules of economy. Sustainablility only is possible if the goal of economy is redefined from creating more human wealth to satisfying our needs while safeguarding Earth's life-support system. Figure created by Jules-Plag (2013). With this new view on the role of economy, progress towards sustainable development as defined by Griggs et al. (2013) becomes inherently the goal of economy. Griggs et al. also proposed six Sustainable Development Goals, and in this view on economy, these goals are also inherent goals of economic activities: to develop a universal clean energy system, to ensure healthy and productive ecosystems, to ensure sustainable water and food supplies, to develop thriving lives and livelihoods and to interact with a new governance for sustainable societies. Sustainable development as defined by Griggs et al. is only achievable if it becomes the sole reason for economy, not a co-lateral by-product. Economic activities that do not contribute to sustainable development and the goals proposed by Griggs et al. are unethical. This paradigm shift in the role of economy also implies an imperative to develop new ways of compensation for economic activities and of financing governance. The new view on economy supports the seventeen Sustainable Development Goals (SDGs) accepted in 2015 by the United Nations. We agree with those who point to the necessity of a great transition, such as Paul Raskin et al. (2002), the Tellus Institute of the Great Transition and the Great Transition Initiative. Economy for humanity aims to facilitate the great transition.